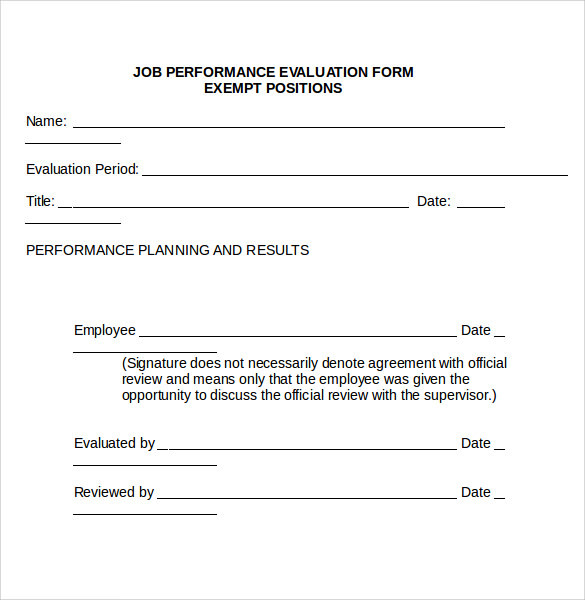 The job Performance Evaluation Forms is important for the job. This will helps to improve the performances and communication level. The main objective of the performance evaluation was to offer the workers or the employee feedback what requires to the improvement and what the workers are performing correct.This will helps to improve the performances of the employee. The evaluation helps to the entire problem and the quires of the workers. This will be essential for all the fields mainly for the job. The performance evaluation helps to solve all the problems of the every employee and to do the task in an effective way. 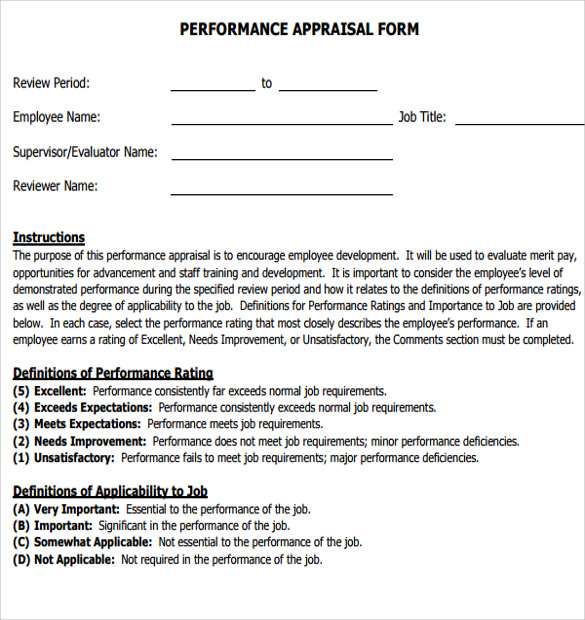 This appraisal form is very effective in understanding the job performance of any employee. The template starts with the personal details of the staff paired with employment date and review period. It also mentions the name and post of the appraisee. Performance assessment is done after rating the attendance, job knowledge, work quality, initiative, motivation, team work, general conduct and discipline of the employee. There is another column for overall performance rating. This format comes with rating guidelines. This template is very useful to evaluate employees working under a company or organization. Though it describes the performance level of the staff members but it has to be filled up by the team-leader or the supervisor who is leading this group of men/women. 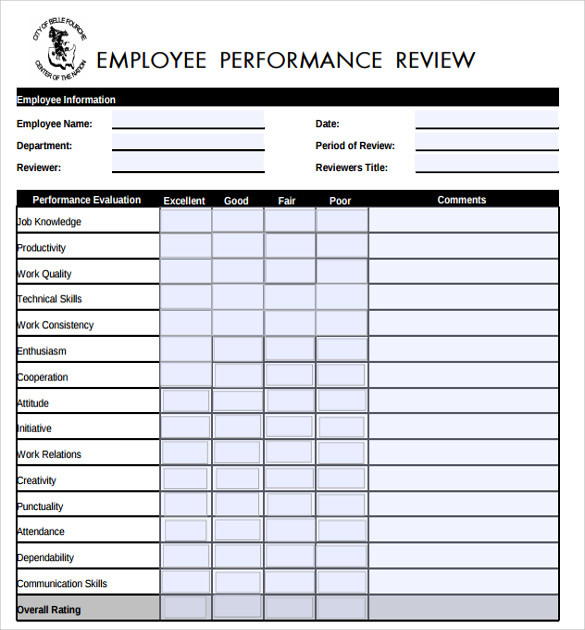 Structurally this performance evaluation template is very similar with the previous template. It is also meant to judge and evaluate the job performance of the employee. In this form, the supervisor needs to mention the review period clearly. Then it has clear instruction on how to judge the employee on basis of the following points. It also explains the exact meaning and impact of the ratings. It also comes with a section to describe the strength and areas for development of the staff. 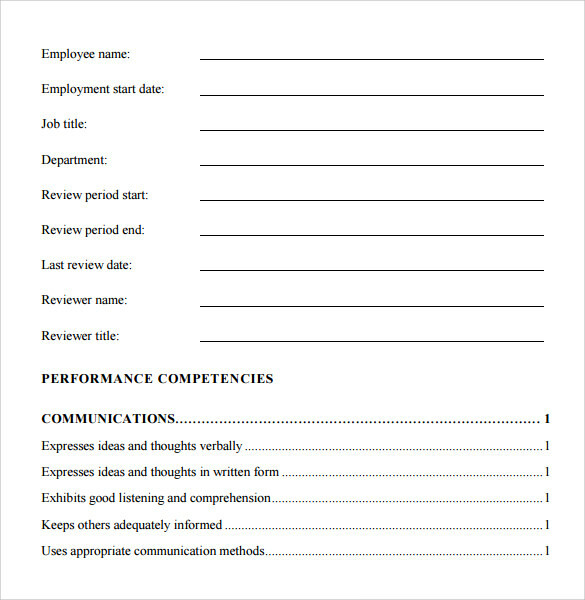 This simple performance review form comes with many performance evaluation factors like job knowledge, productivity, work quality, enthusiasm, cooperation, attitude, creativity, punctuality, attendance, and dependability and communication skill. Then the reviewer has to give an overall rating after analyzing each factor. This form also has space to write down the thought of the reviewer on scopes of improvement along with special remarks. 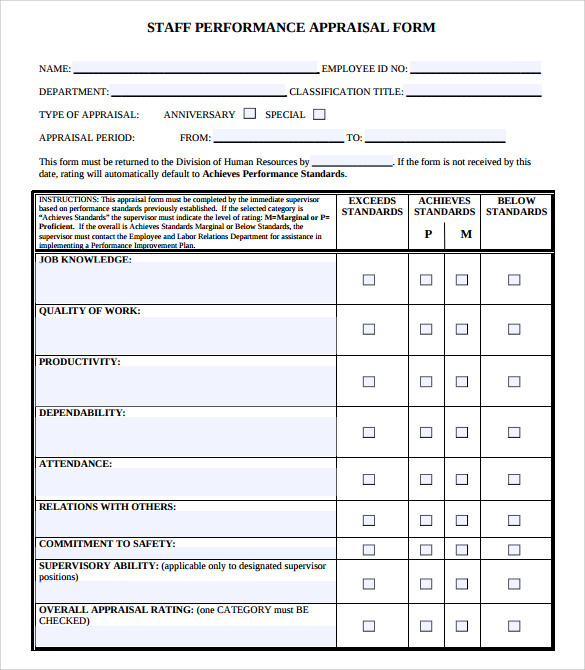 What is the Benefit of Job Performance Form? If you are leading a team or running an office, it is important to know how the employees are working. Overall job performance of staffs has a great impact on growth of any organization. So, the employer must know the strength and weakness of the employees to set future targets. It also helps the reviewer to keep a track record of a particular employee’s improvement over the years.You can also see Sample Employee Evaluation Forms. When Do You Need Job Performance Template? There is no such specific time to implement job performance drive in your organization but it is mandatory to evaluate the employees before annual appraisal, increment or promotion. This template lets you know the strengths of the employees so that you can determine who is good for what. It is one of the best ways to allocate responsibility among the people. Depending on the goal of the appraisal, you have to decide on the evaluating factors that need to be included in the template. 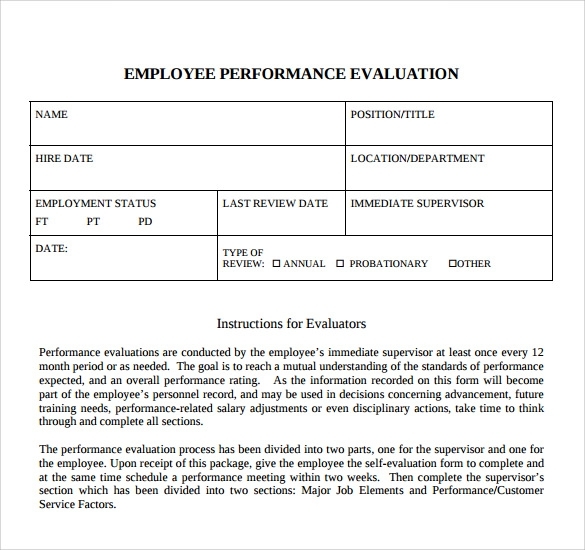 One appraisal form should contain job performance valuation of only one employee. Keep spaces for special comment of reviewer/ supervisor. It is recommended to keep a column reserved for employee’s remark on the appraisal. 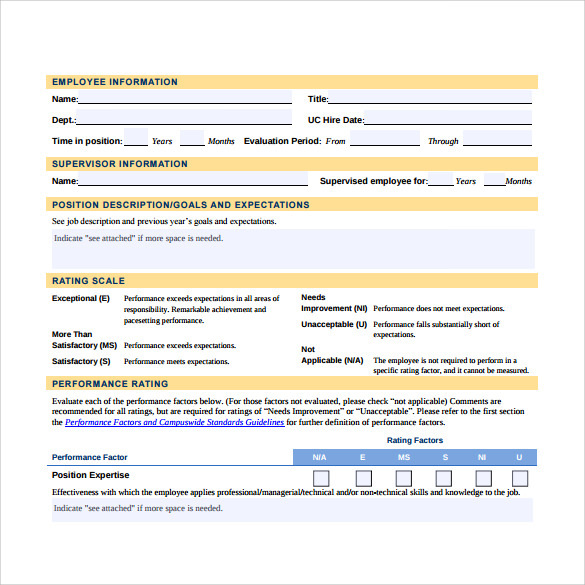 If you are not sure of designing a job performance evaluation template, you can search for online sample templates which are absolutely free to download. 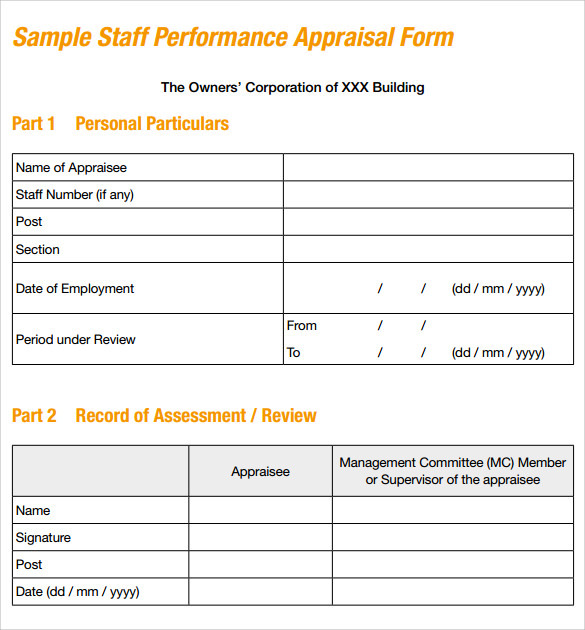 This appraisal forms actually help the company to understand how the staff members are working and what they need to improve their performance.You can also see Sample Evaluation Forms.